In last week’s Nutrition Tip Tuesday: Egg Information, Unscrambled, I explained why I believe in eating the full egg (not just the white), and why eggs are a great source of protein. For today’s post, I am going to take that one step further and explain to you how to buy your eggs. 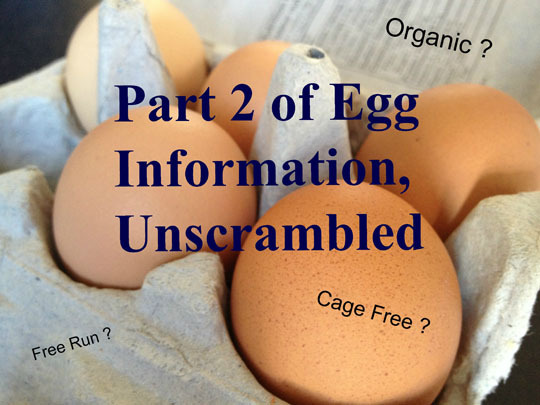 There is so much confusion and marketing jargon out there relating to free run eggs, free range eggs, cage free eggs, etc so hopefully after this post, you are a bit clearer on egg information and how to buy them. Here’s a list of common claims in order from what I deem to be worst to best. This really has no regulation and is just a marketing claim. Chickens are likely in the battery cages with no rules related to space, being let outside, or what they’re fed. Cage free or free run just means that the chickens are not confined to battery cages. It means the hens can run around, but it does not specify where they can run around. Both cage free and free run chickens do not need to have any access to outside. The chickens could be packed in like sardines, and there is no guidelines as to what they have to eat. Lastly, there is also no 3rd party verification. Free range means that the hens are actually let outside, but only weather permitting and ‘weather permitting’ is quite a lose term. There’s also no guideline on how much time they spend outside, or the amount of space. Free range does not specify anything regarding what the chicken is fed, and again, there is no 3rd party verification. In my opinion, Certified Organic is the best and this is something you want to spend the extra money on. There is 3rd party verification and the chickens must be ‘free-run or free-range, have at least 1667 square centimeters of space, outdoor access, organic feed, and living conditions that encourage natural behaviour.’ Organic feed also means no antibiotics, hormones or animal by-products are in their feed, which is a big plus. Omega 3 labeled usually means they were fed some flaxseed or fish oil. Canada does regulate the amount – it must contain at least .3g of Omega 3s. However, for there to be 0.3g or 300mg of Omega 3 in the egg, think about how much the chicken has to be fed!! That is completely unnatural, and this claim also again doesn’t regulate the living conditions of the chicken. I’ve posted lots of other natural sources of Omega 3s such as hemp hearts, Holy Crap, and salmon that are much better alternatives. If you are lucky enough to live near a chicken farm that isn’t certified organic, but you know has ethical practices – I highly recommend that! !